Lord Steel Industry Company Limited is a Famous Aisan Engineering Solution Provider in Anti-Corrosion and Heat Resistant Material in Tube&Pipe. 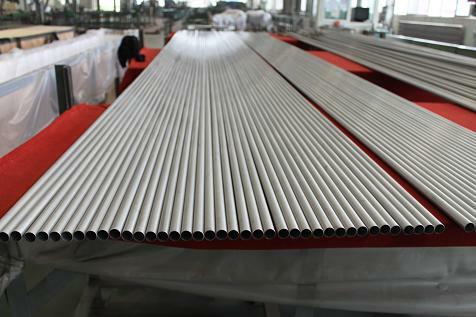 Super Ferritic Stainless Steel is a new material used for Seawater Power Station developed by Plymouth Tube Co, Known as Brand Sea-cure, which is known for a Alternative to Titanium and Copper tube material for condensers. The material is named as UNS S44660 with excellent seawater corrosion resistance,Acid Condensate Resistant,Chloride Stress Corrosion Resistant,Cracking and Pitting Corrosion Resistant as well as lower ductile -to-brittle transition temperature than similar ferritic steel with nickel additions and good ductility. Lord Steel Industry Company Limited and their pertner plants spend more than ten years time and energy in developing and researching such material and their qualified goods-ASME SA268-2010 UNS S44660 Super Ferritic Stainless Steel Condenser Tubing(7/8"OD * 0.028"Wth * 31Feet And 1"OD * 0.028"Wth * 34Feet) has been successfully installed in condensers for a famous nuclear power station in 2010, all the test results and datas proved to be excellent and better than the material list on standards by TPI and Contractors,Buyer and the End-user. Plants has been awarded as the National Scientific and Technology Special Achievement by Government. "LSI can see the future of this products and will continue to promote and improve the material UNS S44660" said by Mr.Chow, the managing director of LSI for a new products press conference in 2011. In 2012, LSI continue to put energy and time in developing new anti-corrosion and heat resistant material in tube&pipe, the promotion of UNS S44660 will be also a important marketing strategy for LSI and hope to build more relationship with global engineering project contractor.